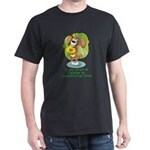 Spay Neuter Rescue Adopt T-Shirt - Make your message known with this great design! Spay, Neuter, Rescue, Adopt, the message is clear and uncomplicated. White lettering with black paw prints. A must for any animal lover.